In 2018, Ozzy Osbourne began the No More Tours 2 tour – and this time, it may truly be the last. So its not surprising that every fan around the world has been baying for attention and the legendary rock star has extended his final tour into the following year – this time, with incredible support from thrash metal legends Megadeth!! 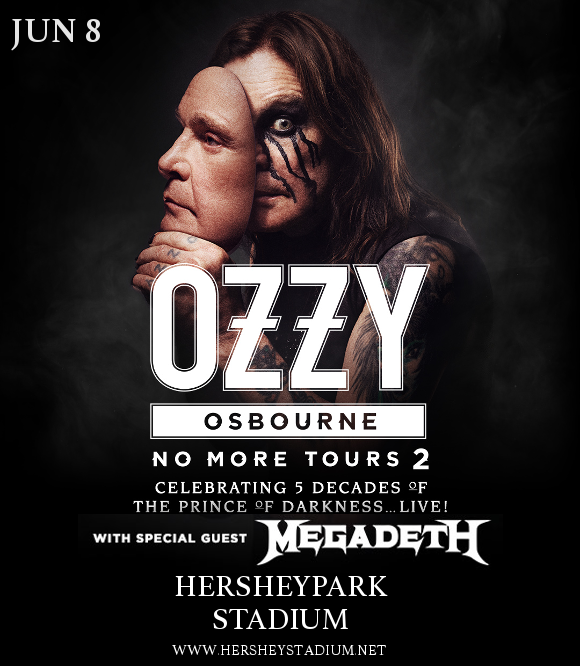 Its all happening at the Hersheypark Stadium on Saturday 8th June 2019 – NO self-respecting Ozzy Osbourne fan can afford to miss his last series of shows EVER! As the frontman of Black Sabbath and following that, an iconic solo artist, after a long and prestigious career, Ozzy Osbourne, known for his incredible resilience and charisma, is finally deciding to wind things down and spend more time with family. Have you got those tickets yet?? HURRY – they won’t last! !